Back in March of 2018, we ran a small piece detailing the full cycle of the K&L Spirits single barrel program. Our spirits buyers, after tasting through dozens of samples/barrels at the source, hand select the best single casks from Bourbon country to be bottled up and sold a few times a year. Occasionally, we end up with the empty barrels which we hand deliver to local breweries like Hop Dogma, Freewheel, Cellador, Shady Oak, Good Beer Company, Alpha Acid, etc, to be filled with delicious beers ranging from Scotch Ales to Stouts to Barleywines! This program really gained steam in late 2014 when David OG from K&L hooked up his childhood friend Jacob McKean (whose brewery Modern Times was just barely a year old) with three Four Roses barrels. He aged their decadent Monster’s Park Imperial Stout in these barrels for nine months, at the time three months longer than any other BA beers they had made. The bottles, sent to us with a smaller run of Elijah Craig casks (at the time, the last barrels that were sent out via the discontinued Single Barrel program), became the first K&L Barrel Aged Beer releases, available only at K&L and through the small Modern Times League Membership. Classic bourbon traits of caramel, vanilla, oak spice, cinnamon, and toasted bread interwoven with rich chocolate and coffee notes from the Imperial Stout made them an instant hit, selling out within a few hours. Brutish yet decadent, this hefty liquid was split into two bourbon barrels, where it hibernated peacefully for a year-and-a-half. Upon emergence, this power-combo of barrels melded together to shape complex layers of toffee, biscotti, maple, and bakers chocolate. Devil's Teeth had a residency time of 14 months and 18 months in their respective barrels. Exclusive to K&L Wine Merchants and Modern Times League Members! This is Mega Devil's Teeth, aged in a single barrel, barrel selected bourbon barrel, sitting on oak for 17 months before being racked out. These single barrel blends can be extremely unique: This particular variant had tasting notes of brown sugar cookies, toffee, caramel, and chocolate. Exclusive to K&L Wine Merchants and Modern Times League members! Modem Tones is one of our biggest, thickest Imperial Stouts, with even more body and gravity than Monsters' Park or Devil's Teeth. Showing roasty chocolate flavors paired with a thick treacle and caramel. Aged 14 months in barrel. Exclusive to K&L Wine Merchants and Modern Times League members! Devil's Teeth aged in these barrels for 23 months, picking up notes of coffee cake, bakers cocoa and a hint of nuttiness. Exclusive to K&L Wine Merchants and Modern Times League Members! Devil's Teeth is a hybrid of an Old Ale and an Imperial Stout, two English beer styles designed to withstand long voyages and dark winters. It brings rich maltiness & robust roastiness in a thick, tongue-coating, aggressively flavorful package. We aged Mega Devil's Teeth in these barrels for 18 Months. It emerged from the oak with notes of toffee, rich cocoa, and lots of sweet candy-like complexity. Exclusive to K&L Wine Merchants and the Modern Times League Members! 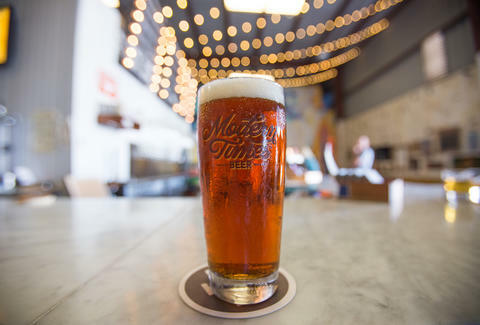 This Thursday, 9/20, in Redwood City, we will be hosting Modern Times from 5-6:30pm to taste Barrel Aged releases along with many of their other core, seasonal, and small batch beers! The full lineups are listed under the local events page.